U.S. Transportation Secretary Anthony Foxx toured the North American Bus Industries (NABI) Bus manufacturing headquarters facility in Anniston, Ala., on Wednesday as part of his "Invest in America, Commit to the Future" bus tour. At NABI, more than 700 skilled workers make and assemble hundreds of transit buses deployed in communities nationwide to connect riders with opportunity. Foxx’s visit is part of a multi-state tour highlighting the urgent need to invest in America’s transportation infrastructure at a time when the nation’s surface transportation programs are set to expire and the Highway Trust Fund is running out of money. NABI Bus, a division of New Flyer Industries Inc. and a major employer in northeastern Alabama, is on track to make and assemble about 600 heavy-duty transit buses this year for several transit agencies, including Dallas Area Rapid Transit and the Washington Metropolitan Area Transit Authority. Over 95% of NABI’s bus orders are triggered by transit agencies that receive funding from the Federal Transit Administration. These new, fuel-efficient buses help transit agencies replace aging bus fleets and improve reliability for millions of riders. 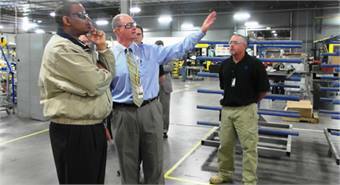 Foxx’s tour of the NABI plant included stops at the robotic paint shop and the main assembly area for engine installation. After touring the facility, Foxx spoke about the Administration’s plan to address the infrastructure deficit with a $302 billion, four-year surface transportation reauthorization proposal. The plan will invest in our national infrastructure network, increase safety and efficiency and provide greater access to ladders of opportunity, all without adding to the deficit. Later this month, Foxx and President Obama will send a bill to Congress that will make this vision a reality and put more Americans back to work repairing and modernizing our roads, bridges, railways, and transit systems. Foxx’s Invest in America, Commit to the Future bus tour is taking him through eight states in five days. The tour includes visits to manufacturers, bridges, freight facilities and highway projects in an effort to raise awareness of America’s infrastructure needs. Foxx is visiting with business leaders, stakeholders and community members to discuss how transportation projects are making a difference, and to highlight infrastructure gaps that we need to fill in order to promote economic growth and American competitiveness. To follow the trip’s progress, click here.